Geostatistical Error Management will enable environmentalspecialists to perform assessments of hazardous waste andenvironmentally impacted sites more accurately and to confidentlymanage uncertainty and error at every phase of a remediationproject. About the Author Jeffrey C. Myers has over twenty years experience applying geostatistical methods to practical problems in both the mining and environmental industries. His work has included ore reserve estimation on projects involving commodities such as gold, silver, platinum, copper, lead, zinc, uranium, coal, lignite, gypsum, limestone, trona, diatomite, and sand and gravel. He participated in the development of commercial geostatistical software and installed customized ore grade control stations at working mines. Mr. Myers has extensive experience modeling hazardous chemicals in soils and groundwater, including VOCs, pesticides, heavy metals, PCBs, PAHs, and radionuclides, and has supplied expert support on numerous Superfund litigations. He has taught public and private geostatistical short courses for over a decade and taught graduate-level courses in environmental statistics. Mr. Myers holds a Bachelor of Science degree in Geology from West Virginia University and a Masters degree in Mining Engineering from the Colorado School of Mines. 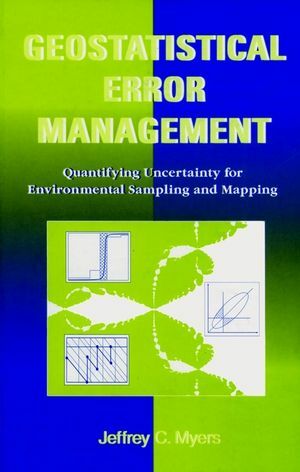 INTRODUCTION TO GEOSTATISTICAL ERROR MANAGEMENT. Foundations of Geostatistical Error Management. Variograms: Quantification of Spatial Continuity. Integrating DQOs and STP: Development of Sampling Strategies. Integrating DQOs and GA: Mapping and Appraisal.